B.O.N Skincare Nourishing Skin Oil All Natural Toning Blend To Help Reduce Stretch Marks During Pregnancy Spray Bottle, 3.38 fl. oz. 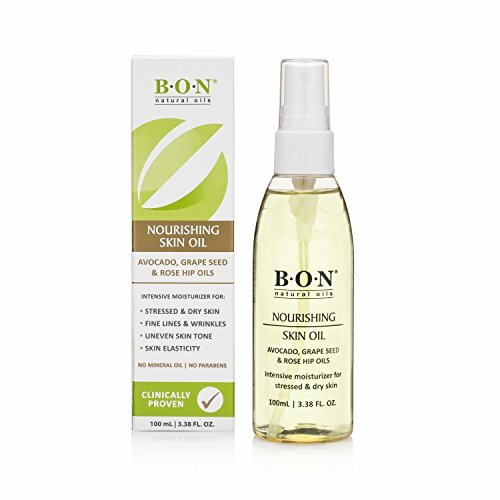 B. O. N nourishing skin oil is a powerful oil blend and an intensive moisturizer for use on belly, hips, bust, scalp, nails and hair to relieve dry and itchy skin. Will improve skin tone and skin elasticity to avoid new tears and will assist in repair of old tears. Why settle for one oil when you can get the benefits of a blend? Avocado Oil is high in Sterolins which supports hydration and toning. Rose-hip oil helps skin rejuvenation and quickens healing. Grape-seed oil is high in antioxidants and promotes regrowth vitamin E boosts skin nutrition and elasticity. If you have any questions about this product by B.O.N Skincare, contact us by completing and submitting the form below. If you are looking for a specif part number, please include it with your message.